Auto listing sites are becoming more and more popular as vehicle shoppers continue to research their next vehicle online rather than at a dealership. These potential customers are looking for a user-friendly experience that has enough vehicle details and sorting options to help them find the right vehicle and get in touch with that specific dealer. 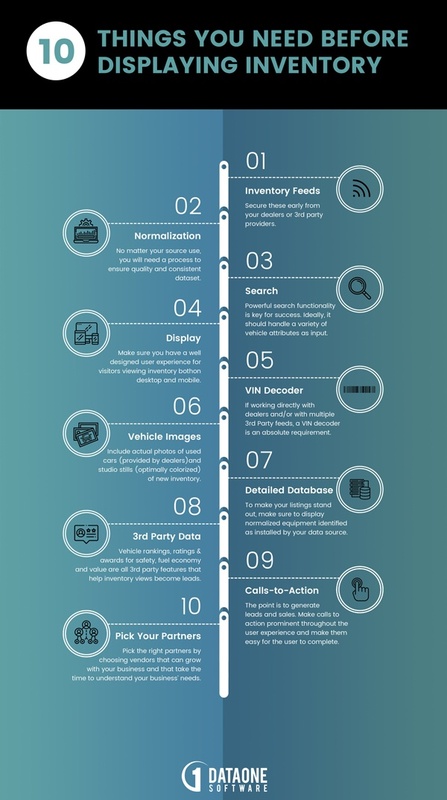 In this infographic, we have defined 10 things you will need to create a successful automotive classified listing portal. Click on the infographic if you'd like to download the PDF! If you're looking to dive deeper into the best practices of a classified auto listing site, download the white paper below. "Classified Auto Listing Sites 101" covers many of the steps included in the infographic above, such as the use of a VIN decoder and normalization for these feeds in much more depth.